24 11 08 - 10:53 Afrikan t�hti (Star of Africa) is a legendary game, one that nearly every Finn knows. Designed by late Kari Mannerla in 1949 (at the age of 19), it has thus far sold 3,5 million copies (1,7 million outside Finland!) and is cherished in childhood memories all over the country. It has also been translated to 16 languages, and is still available in nearly all Finnish supermarkets and bookstores. Why am I writing about this? Well, browsing an auction site, looking for a fun board game to play, we found a rare sequel! Afrikan t�hti a fairly simple and straightforward game; the one who finds the fabulous Star of Africa diamond and returns it to either one of the starting points is the winner. The players earn money from various other gems they discover, but are also in danger to lose all their possessions to bandits. The rules of the game take 5 minutes to learn, and one game takes about half an hour (unless the diamond is very close to a starting point, in which case the game can be over in less than a minute). 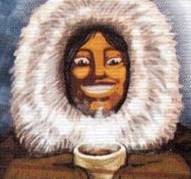 Many reasons for the games success have been presented, ranging from the simplistic rules to the romantic view of the colonialistic era, and the truth is probably a combination of them all. 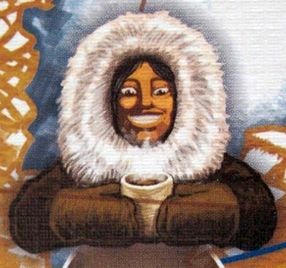 The game still sells 30,000 copies a year, so whatever the reason for its success might be, it remains an integral part of Finnish cultural heritage, along with Nokia, rye bread, Fazer milk chocolate, and Father Christmas. Afrikan t�hti received an official sequel in 2005, called Inkan aarre ("The Treasure of the Inca"), which is essentially the same game, but introduces a few new rules and takes place in South America. However, in 2006, the coffee manufacturer Paulig hired the advertisement agency SEK & Grey to create a fun product to be given to the employees and the co-operative partners as a Christmas present. 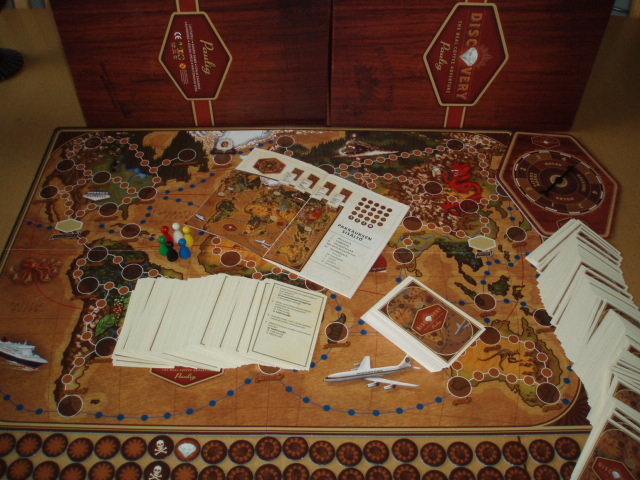 SEK & Gray, the very company that Afrikan t�hti designer Kari Mannerla led for decades, came up with Discovery - The Real Coffee Adventure; a board game very similar to Afrikan t�hti. It was never sold anywhere, and can be considered quite rare. We found this game in an online auction. We didn't know anything about the game, and the purchase was based almost entirely on the low price (8 euros!) and the coffee theme. Luckily, the game turned out to be great, and after three full games it feels even better than the original! In Discovery the players are also after a huge diamond (named "The Paulig Diamond"), but there are several differences to Afrikan t�hti; the most obvious one is that the game board covers the entire world, not just one continent. Also, there is no money in the game; the currency used is coffee beans that can be found from the markers scattered around the world. Turning a marker in Afrikan t�hti cost 300, but in Discovery you're granted the right to open the marker if you answer correctly to a multiple-choice quiz question (often coffee-themed). Occasionally instead of a question an action occurs. wholesale Jerseys free shipping – http://www.wholesaleCheapJerseysshipping..
cheap jerseys free shipping – http://www.cheapwholesalejerseysshipping..
Wholesale Cheap Jerseys – http://www.WholesaleCheapJerseysStore.co..
wholesale jerseys from china – http://www.wholesalejerseyscheapfromchin..
wholesale authentic jerseys – http://www.wholesalecheapauthenticjersey..
cheap authentic jerseys – http://www.cheapauthenticwholesalejersey..
wholesale Soccer jerseys – http://www.wholesalecheapsportsjerseys.c..
cheap jerseys wholesale – http://www.cheapjerseyswhoesale.com/site..
Sitemap-Shoes City SiteMap – http://www.cheapshoesfreeshipping.com/si.. Cold News SiteMap – http://www.shoponlinenews.com/News/Cold/.. Fashion News SiteMap – http://www.shoponlinenews.com/News/Fashi..
Sports News SiteMap – http://www.shoponlinenews.com/News/Sport.. Fake oakley sunglasses – http://fakesunglasses.shoponlinenews.com..
cheap ray ban sunglasses – http://cheapsunglasses.shoponlinenews.co.. Please type the word OTSEP in reverse. » Timo.herd.fi/lukuvinkkeja Annan t�st� l�htien lukusuosituksia ja kirjavinkkej� suomeksi osoitteessa Lukuvinkkej�.